This is going to be a quick comparison writeup, between the Metabones and the Novoflex (which I've just received in the mail) adapters. 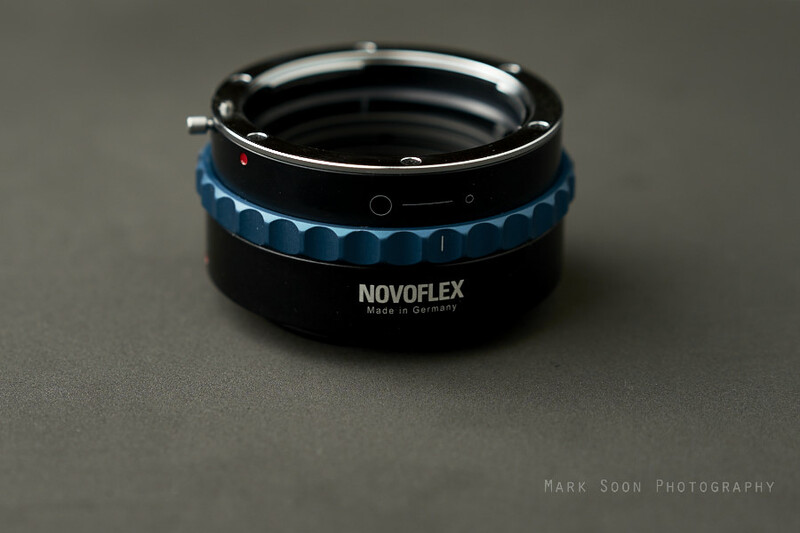 To kick things off, let me first explain why I ended up purchasing the Novoflex adapter (which costs twice as much as the Metabones). "It's a huge waste of money", as a lot of people on the forum might say but I saw it as an insurance policy for my Sony A7II. The Metabones adapter is solid, and what I liked about it was the fact that it had a tripod mount and a long "throw" with the aperture ring. What I mean by this is that you have to turn the aperture ring quite a bit more than the Novoflex to go from a wide open aperture, to a maximum aperture of your lens - this is a good thing. The aperture ring is also marked with numbers, from 0-7. I don't believe these markings correspond to the actual f-stop of the lens but they act as a general marker so that you can kind of guess where your aperture is at. The thing to remember is that with manual aperture adapters, there is no "talk" between the A7 body and the lens, meaning you won't really know what aperture you're currently at. You'd have to guess it by looking at how many stops you close down from your shutter speed readings. The downside, and the reason why I bought the Novoflex, was because only after a week of use, I noticed little circular scratch marks on the A7II's lens mount. They are tiny, but I haven't been taking the adapter on and off a lot. Over time, I guess this would become a big problem because of loose metal filings that might fall onto the sensor itself. The other thing I noticed was that on the day I received the Metabones, the inside and mount area of the adapter had some sort of silvery power coated all over it. It must have been machine dust or very fine metal filing from the machining of the product. I gave it a good blow out with the Giotto's Rocket blower before use but it did cause me quite a bit of concern. If you've just purchased yourself a Metabones, I would recommend running your finger around the mount (camera side of the adapter) before you put the unit on. If you notice even the slightest peak or sharp bit, don't mount it or you might risk shaving some metal off your camera mount. This is especially true where where there are screw holes involved. If they aren't machined perfectly, mount damage will occur. I did some scouting around in various forums and the general opinion of the Novoflex adapters was "overpriced, but very well made". And they were right about that. The Novoflex Nikon G to NEX adapter set me back something around $250, and for an adapter that was a big call to make when I was sitting on the fence deciding whether or not to purchase it. When the unit arrived however, I realised that it was worth paying for. The mount finish on the camera side is polished, black metal. The lens side is the standard metal finish. When the Novoflex mounts on the camera, the turn is silky smooth and buttery, unlike the slight grinding/rough feeling that comes from the Metabones. As mentioned before, the Novoflex is way too expensive. Costing twice as much as the Metabones. Also, the Novoflex doesn't have a tripod collar to mount on a tripod, which could help alleviate the stress from mounting larger Nikon lenses. But I don't find this to be a huge game changer because the fit between the adapter and the A7 is perfect and there is no play or wiggle space. The fitting is flush and the A7II's mount is all-metal as well. That said, I don't own any giant lenses. The one thing I didn't like about the mannual aperture ring is the fact that it didn't have any sort of markings, or aperture clicks. The only markings on the ring are two circles: one to signify a wide open aperture and the other fully closed. When I mounted my lens to the Novoflex, it shifted my adapter ring in such a way that the markings no longer lined up properly - which I was a little annoyed at but in practice, it won't make any difference to the way I shoot. The ring itself is smooth but "heavy" to turn. You won't lose your aperture settings if you bump the ring or rub against it. All in all, I found that the Novoflex was definitely worth the purchase price, mainly for the peace of mind knowing that no metal bits are going to shave off either the adapter or the camera mount and fall onto the sensor. From a usability and performance standpoint, I found absolutely no difference between the two adapters. If you'd take a look on forums, you'll hear it a variety of reviews about the Metabones adapter. Some have been fortunately enough to get a really well-made copy, and others not so. I hope you've found this review useful. If you've had experience with either adapters, I'd like to hear from you! Drop your comment in the box below.